Barpole is a river in mountainous Coorg District. The Upper Barapole River drains the eastern flanks of Brahmagiri Ghats. It is situated at around 250 km from Bangalore. We had booked the package of the organization NASA (National Adventure and Sports Academy) who conducted the rafting in river Barpole. In kannada 'Hole' means river. the name of the river is Barpu. Barpu+Hole became Barpole. 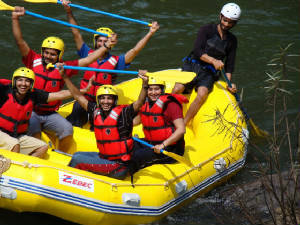 The most challenging Whitewater rafting opportunity in South india is the whitewater rafting on the Barapole river. The actual length of this run is between 3-4 KM, but the rapids on this river stretch can be a class 3-5 (depending on the rain). It was class 4 when we had been, still thrilling enough. 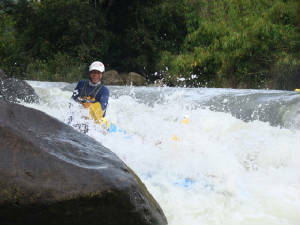 The entire rafting session lasts about 3 hours. This includes a mandatory training session for all rafters. 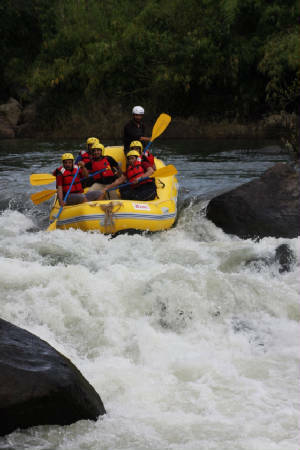 Eventhough you dont know swimming you can darely go to the rafting and enjoy the different thrill.